Things are starting to pick up around here. How would you like this header coming at you down the road! 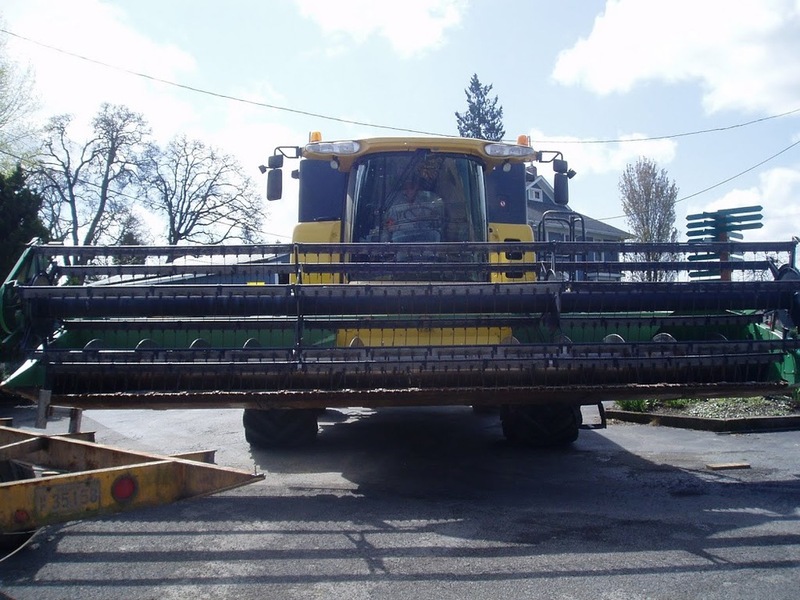 Actually this header is far too wide to drive down the road, so we have to take it on and off between fields and ferry it around on a trailer. It is actually a wheat header. We are working on converting it to fit on our combine. We took out most all of our grassfields and are growing many different crops this year. Wheat, corn, beans, spinach and cabbage seed, along with blueberries and of course the u-pick apples. Since it keeps raining so often, we are working on fixing/updating some of our equipment. As soon as the ground dries out more, we will be working up fields and getting ready for planting the crops. We just finished fertilizing our blueberries...much earlier than normal this year. Pretty crazy. Below we are fertilizing the apples too. This is the time of the year that it is most important to protect the apples from getting disease like apple scab, etc. Next project that will need to be done in the future is thinning the apples. Once the apples are about the size of your thumb, we head out to start thinning. Some rows are especially more important to thin then other...The Gold Rush are really important to thin, otherwise there will be many many apples, but all a very small size. We thin to give the other apples more space to grow. We also planted a brand new row of Honeycrisp. Since the Honeycrisp produce a large crop one year, and minimal to no crop the next, we are hoping this new row will produce opposite than the old rows. We would like to have Honeycrisp available every year. I am also busy getting ready for our flower nursery to open on the 24th! The greenhouse is full of beautiful plants! We are also doing hanging baskets this year. Come check it out! M-F 9-5, Sat 10-5.